This time-based work relates to the mathematical model used to study copper metabolism in humans. The edge of the work is created from an old and decaying oxidised copper window frame. Within this is a plate of fresh copper cleaned of all oxidisation. Two forks of cast aluminium hold blown glass vessels containing a solution of copper-sulphate. 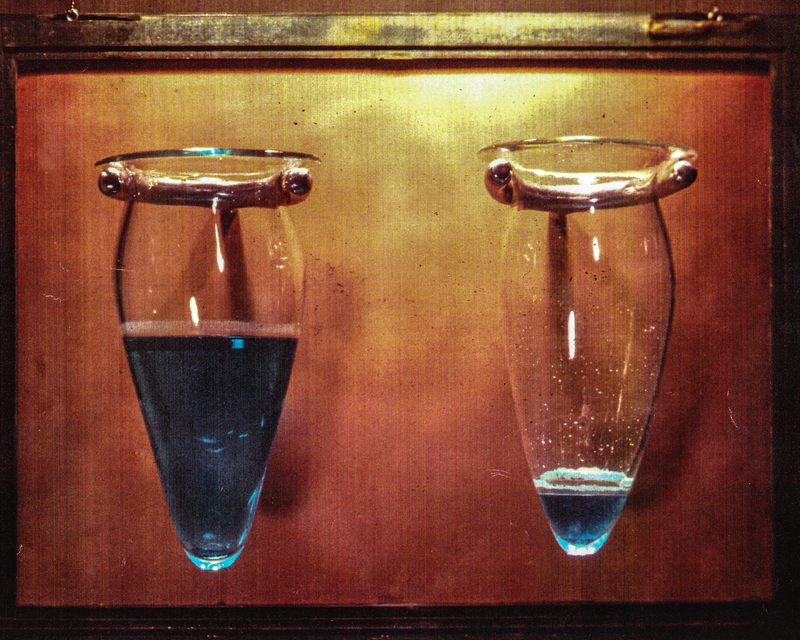 As the water, (or life-giving element) slowly evaporates, copper starts to crystalise on the inside of the glass. Thus there is a dialog between the decay processes of the various materials. The mathematical model used to study copper metabolism in humans involved the subdivision of body copper into compartments that ideally have some physiologic relevance. The amount of copper in each of the compartments and the flow rates of copper between the compartments could be quantified with the use of tracer data as input in the model. One of the results of the model was that the half-life of ceruloplasmin was ≈27 d, which the authors suggested compared well with the value of 20 d that was previously reported. In a 1995 article, the “biological half-time of copper in plasma … was found to be 19.5 ± 5 days (mean ± SD)”. However, as stated in that article, this was not the half-life of ceruloplasmin. Although ceruloplasmin-bound copper accounts for >90% of plasma copper, the biological half-life of copper in plasma after ingestion of a copper tracer is not the half-life of ceruloplasmin, because the half-life of copper is influenced not only by the exit from the ceruloplasmin compartment but also by the input of recycled copper into the compartment from other longer-lived compartments. Evidence for this is included in that 1995 article, ie, the biological half-life for clearance of the tracer from the plasma pool was increased to a median half-life of 43 d in Wilsons disease heterozygotes, in whom, as previously described, decreased biliary excretion of copper results in a greater whole-body half-life than in control subjects. Materials: Reclaimed copper covered wooden window frame, sandblasted copper sheet metal, sand-cast aluminum, soda-lime glass, copper-sulfate solution.